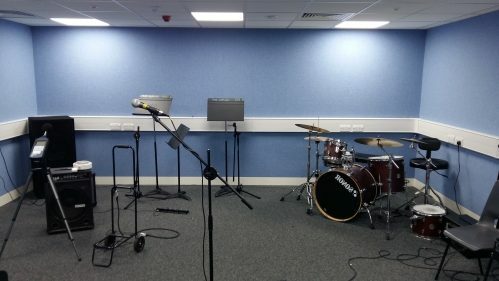 The University of Southampton engaged AGS Noise Control to supply and install two new music practice rooms / performing arts studios. 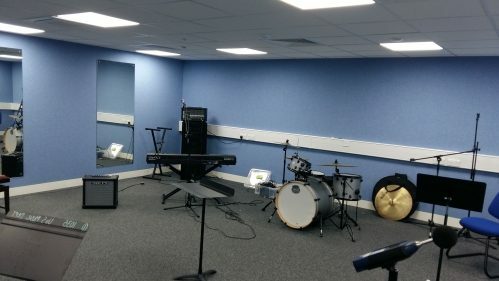 Each of the rooms was intended to enable op to 15 people to practice instruments such as drums, brass, pianos, electric instruments etc. 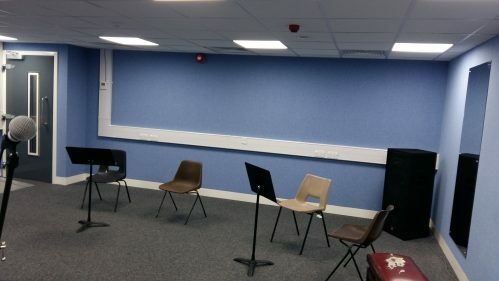 This required a high level of sound reduction to prevent disturbance to adjoining teaching spaces, both next to and above the practice room locations. 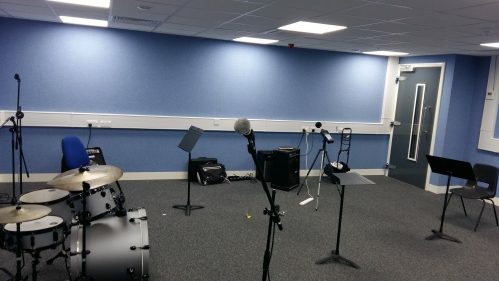 This was achieved by the construction of fully isolated ‘room in a room’ construction where a structurally isolating floor is installed with AGS’s high performance steel acoustic panels to construct the walls and roof of the rooms. 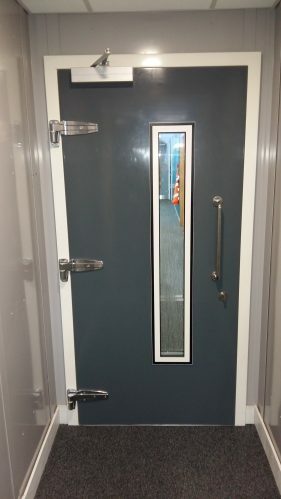 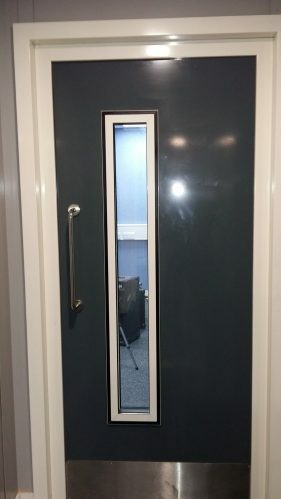 High acoustic performance doors with soft closing magnetic seals installed to form lobby provides access to the rooms whilst students continued practice without disturbing nearby classes. 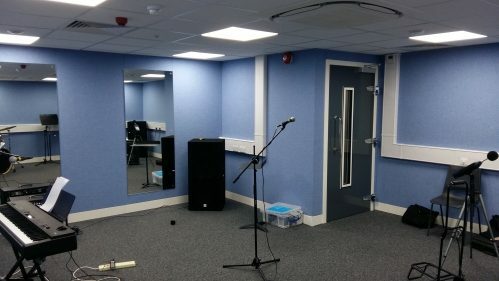 AGS Noise Control installed acoustic ventilation systems to the rooms along with new floor finishes, suspended ceilings and fabric wall finishes completed the project. 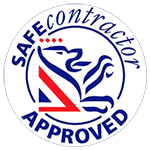 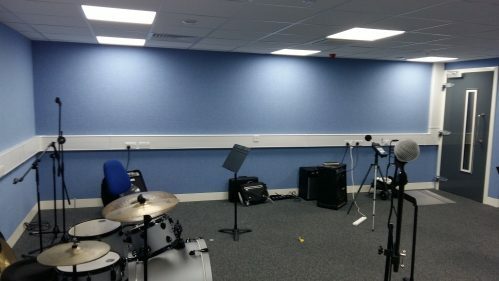 Post installation acoustic testing confirmed the music rooms achieved the required levels of sound attenuation. 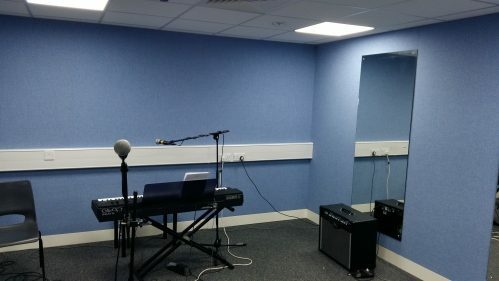 Music practice room with fabric covered acoustic walls and an acoustic door.